A 98-year-old woman who still works at the chip shop she opened with her late husband in the 1920s has been made an MBE in the Queen's Birthday Honours. Constance Brown has been recognised for services to business and the community of Pembroke in west Wales. Among those receiving awards in the region is Margaret Thrush, a street collector from Mumbles who has raised over £1m for charity in 50 years. Carmarthenshire Council leader Meryl Gravell has also been made an OBE. 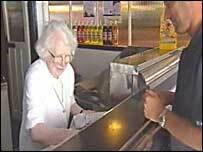 Constance Brown, who continues to work at the family-run Brown's Cafe in Pembroke, turns 99 in August. Her daughter-in-law, Glenys Brown, said she broke the news to her gently so as not to shock her too much. "I think she is quite happy," she said. "She doesn't say a lot but she will be quite pleased to collect it." Mrs Brown opened the cafe with her late husband, Sidney, in 1928. Her daily schedule sees her arrive at the cafe by 0900BST to cut up the day's fish before returning to the premises to fry and serve customers at lunch time. "She is amazing for her age. She lives alone and is independent," added her daughter-in-law. "She made sure we kept the old-fashioned range and she won't have her fish and chips wrapped up in anything other than newspaper. "We are all very proud of her." An MBE caps off an eventful few months for Miss Thrush, who is a familiar face in Mumbles where, wearing her orange sombrero and matching shorts, she can be found in the streets and pubs with her collection box. 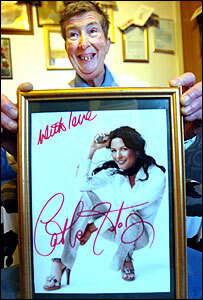 In February the seaside resort threw a party in her honour which included a tribute from Hollywood actress and fellow townswoman Catherine Zeta Jones. The 64-year-old began collecting at the age of 14 and dozens of charities have benefited from her efforts over the years. Trimsaran councillor Meryl Gravell was awarded the OBE, to add to her MBE, for services to local government in Wales. She has led the authority since 1999 and was elected as the Welsh Local Government Association's presiding officer in 2004. "This is good for local government, particularly because we are developing the services for the people of Wales," she said. "For me personally, it is a great honour and a privilege to accept this prestigious award."